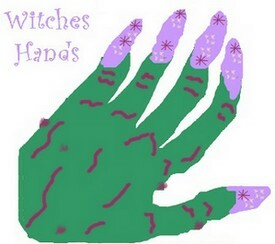 How to make green Halloween handprint witch hands with fancy fingernails – warts and all! This is a handprint craft with a difference! You need only a few inexpensive supplies which you will probably have lying around the house. It is an easy craft to do with a crowd of children and the results are great for decorating the house or classroom. Best of all, you will end up with a fun memento to keep and look back on as the children grow. Draw around the children’s hands onto the green card. Older children can pair up and draw round each other’s hands. Cut out carefully. Use the scraps of paper or card to cut pointed oval shapes for long, spiky finger nails and stick them on – embellishing, if you like, with glitter or stickers. Draw some spidery veins onto the hands, using your own hands as inspiration. Why not add a wart or two? Make them by scrunching tissue paper into a tiny ball and sticking onto the hands with white glue. humorous effect). If you attach them to the edge of doors with sticky-tack it looks as if someone spooky could be hiding on the other side! Alternatively, attach plain white paper to the back of the hands and use them as invitations! black hair in the center of the hand and knuckles!